This band was originally from Dunfermline in Scotland and known as The Shadettes. Manny Charlton hadn't been with them nearly as long as the other three, having previously been guitarist for other local groups The Mark Five and Red Hawkes. The name change came shortly after Charlton joined in 1969. They took the name Nazareth from a line in The Weight by The Band. For the first couple of years they worked on a semi-professional basis establishing a reputation in Scotland as a no nonsense hard rock band. After their first album Nazareth, they went full-time. Both this and the follow-up, Exercises, which also contained some acoustic tracks were recorded down in London, where they decided to move to. Their second 45, Morning Dew, covered a Tim Rose song. Razamanaz, their third album, which was produced by Deep Purple bassist Roger Glover spawned two hit singles:- Broken Down Angel and Bad Bad Boy. The album, too, got to No 11 in the UK Album Charts and No 157 in the US. Their fresh interpretation of Joni Mitchell's This Flight Tonight, which was far removed from the original version, narrowly missed the Top Ten too, later the same year. Glover also produced their Loud And Proud album, which was the first step to establishing the band internationally. It reached the higher echelons of the Charts in four European countries and got to No 150 in the US. Their next 45 UK hit was a self-penned composition Shanghai'd In Shanghai. Their next two albums, Rampant and Hair Of The Dog, which were produced by guitarist Manny Charlton, built on their earlier success both here in the UK and internationally. Rampant yielded another Top 20 UK hit in the form of their cover version of Tomorrow's My White Bicycle. Love Hurts, which had earlier flopped as a single in the UK, gave them a surprise Top 20 hit in the US. Nazareth's version of Ballad Of Hollis Brown later resurfaced on Sequel's CD compilation, The Songs Of Bob Dylan. 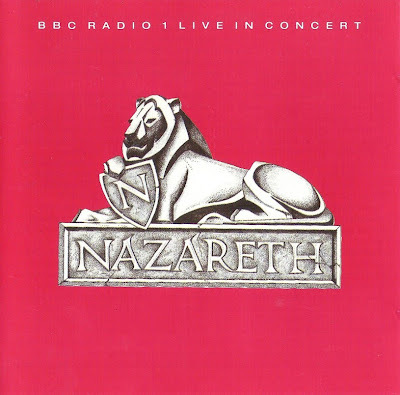 Rarely ever critically acclaimed, Nazareth did prove to be an incredibly stable outfit recording well into the eighties and beyond. Dan McCafferty also recorded a solo album for Mountain in 1975 as well as a number of 45s. In the final analysis the band can only be recommended to fans of hard rock. They're still on the road with only Manny Charlton missing from the original line-up - his place is taken by guitarist Billy Rankin.